Grace Episcopal Church, today one of nine houses of worship in Hastings-on-Hudson, was built with prize money donated by Admiral David Glasgow Farragut, a southerner by birth, who moved to Hastings in 1861, shortly before the Civil War. Farragut’s resounding victories at Mobile Bay and New Orleans made him one of the great Northern heroes of the war (to this day, several streets and the public middle school in Hastings bear his name), and he became the first naval officer in American history to attain the rank of full admiral. In thanksgiving for his safe delivery from war, Farragut donated $1,000 of his prize money from the Battle of Mobile Bay toward building a new church in his village. Richard Upjohn, then one of America’s most famous architects (known for the Gothic Revival Trinity Church in Lower Manhattan) designed the church in a style known as Hudson River Gothic. The anchor finials, still on the dormer windows, are said to be a symbol of grace and hope. The construction of what was then called Zion Chapel cost $6,000. The cornerstone of the church, an event attended by Farragut, was laid on October 2, 1867. In 1909, the Rev. Walter Archbold became Zion Chapel’s first full-time vicar and in 1917, under the leadership of the Rev. Horace Clute, the mission became an independent self-supporting parish known as Grace Church. During World War I, several hundred Army troops were quartered in barracks along Warburton Avenue; many of them found refuge in nearby Grace Church. The first floor of the adjacent vicar’s cottage was converted into a clubroom for the troops and the women of the parish took turns serving refreshments and mending the men’s uniforms. In 1919, the parish was given “Cooke’s Woods,” the land the church sits on today, by a wealthy family and parishioner whose homestead stood on the site of what is now La Barranca Apartments on South Broadway. The gift stipulated that the parish build a church on the property and maintain the Cooke family cemetery in the rear of the land in perpetuity. 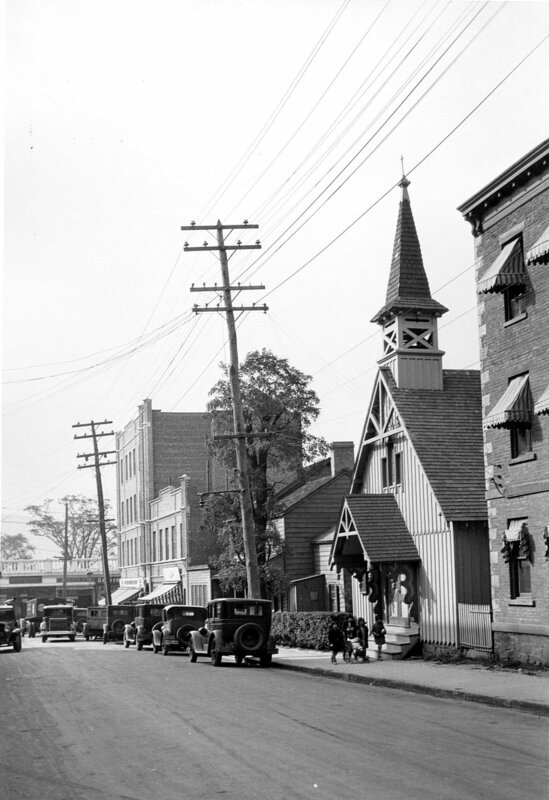 The church began a building drive in 1922 with a goal of raising $100,000. Among the contributors to the drive was the famed theatrical couple (and Hastings’ residents) the producer Florenz Ziegfeld (of Ziegfeld’s Follies) and actress Billie Burke (Glinda in The Wizard of Oz). Richmond Shreve of Hastings (architect of the Empire State Building as well as the Hastings Municipal Building and most of the Farragut Avenue public schools) was hired to design the new church. But with the advent of the Depression, parishioners were suddenly unable to make good on their pledges and construction came to an abrupt standstill. Under the creative stewardship of the rector of Grace, the Rev. Walter Overs, the vestry voted to put a roof on what had begun as the new church and make it the parish hall, and then move the original Upjohn church (at the bottom of Main Street) onto the new site. In November 1930, Main Street was sealed off to traffic for 48 hours in preparation for the move. The church steeple was removed in order for the building to fit underneath the telephone wires. Then, in what has become Grace Church’s most famous hanging-in-the-balance moment, while the church was firmly lodged in the middle of the street, the movers went bankrupt. The vestry came through once again and managed to raise the funds necessary to move the church onto its new site. Bishop Overs also oversaw the construction of the present English Tudor-style rectory by Sears and Roebuck, one of the company’s earliest prefabs. Grace’s succeeding rector, the Rev. John E. Reilly, arrived in 1934, when there were 47 parish contributors and a $32,000 debt. By the end of his rectorship in 1940, the contributors had more than doubled and the debt had dwindled to $18,000. The Reverend Reilly was succeeded by the Rev. William D.F. Hughes, who served Grace from 1941 to 1945. His pastorate was followed by that of the Rev. James L. Whitcomb, who was rector from 1945 through 1951. During the Rev. Arthur R. Willis’s pastorate, from 1952 to 1971, the parish hall was doubled in size to provide more classrooms and an enlarged area for parish, civic and social functions. From 1970 to 1980, there was a population decline in Hastings of nearly 1,000 people. Grace then entered into a period of shared ministry with its onetime parent, Zion Church, in Dobbs Ferry. The Reverend George E. Packard became Grace Church’s next rector, beginning with a part-time ministry in 1979 and as a full-time rector in 1984. During those years the parish saw a surge in growth, including a number of families with young children. Grace Church also helped sponsor a refugee family from Liberia and oversaw major capital improvements to the church undercroft and Sunday school classrooms. In 1988, Reverend Packard left Grace to become Canon to the Ordinary for Bishop Richard E. Grein. The Reverend Packard was elected Fifth Bishop Suffragan for Chaplaincies and consecrated in February of 2000. Grace church had an interim priest until 1991, when Betty B. Hudson came to serve as rector. Under the Rev. Hudson’s stewardship, a number of major capital improvements were made to Grace, including a new church addition (designed by Grace parishioner and architect William Hall). The Rev. Hudson also instituted the annual Alternative Gifts Market, the church’s largest mission project, which, through the sale of alternative gift donations and fair-trade craft items, raises thousands of dollars to help preserve the environment and help struggling people around the world achieve self-sufficiency. During the Rev. Hudson’s ministry, Grace hired a Sunday school director and implemented a Youth Group to guide the church’s growing population of children and young adults. The Rev. Hudson retired in 2007, and in August of 2008 Grace Church called the Rev. Dr. Anna Pearson to serve as rector. During her ministry, the Rev. Pearson initiated a number of local missions focused on the sharing of food and fellowship. The Grace Community Table hosts an intergenerational meal bringing together seniors and teens. The Grace Food Partnership collects and distributes food to local food pantries and families in need, and the Breakfast Run prepares and distributes a hot breakfast to homeless people in New York City. In 2018, the parish hall kitchen was renovated (designed by Grace parishioner and architect, Ray Dovell) allowing the parish to expand these efforts. As witness to the parish's call to environmental stewardship, Grace Church installed solar panels to the parish hall roof in 2016 thereby reducing the consumption of energy. In 2018, the Rev. Pearson was called to Holy Apostles Church in Manhattan where she became their rector and the director of their soup kitchen. Today, the parish of Grace Church has 233 members and is actively searching for a new rector to begin the next chapter of our church life.